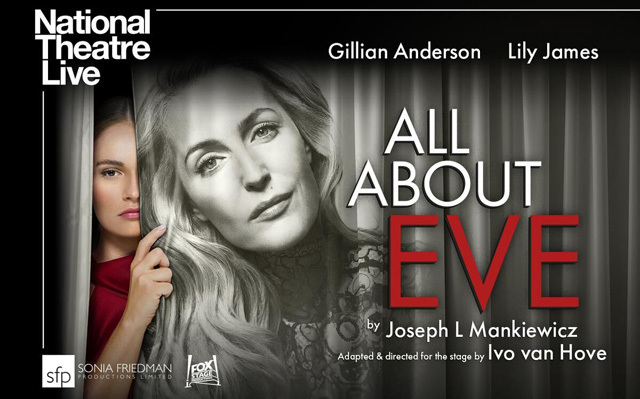 All About Eve tells the story of Margo Channing, played by Gillian Anderson. Legend. True star of the theatre. The spotlight is hers, always has been. But now there’s Eve (Lily James). Her biggest fan. Young, beautiful Eve. The golden girl, the girl next door. But you know all about Eve…don’t you…? All About Eve is adapted by Ivo van Hove from the 1950 Twentieth Century Fox film by Joseph L Mankiewicz and the play The Wisdom of Eve by Mary Orr. Certificate: This screening is certified PG – contains scenes of alcohol misuse and infrequent mild violence.